Char Fasson Upazila (Bhola district) area 1440.04 sq km, located in between 21°54’ and 22°16’ north latitudes and in between 90°34’ and 90°50’ east longitudes. It is bounded by Lalmohan upazila on the north, Bay of Bengal on the south, Manpura upazila, Shahbazpur Channel and Bay of Bengal on the east, Dashmina and Galachipa upazilas on the west. There are more than 100 chars in the upazila, most noted of which are Char Kukri Mukri, Dhalchar, Char Manika, Char Aicha, Char Nizam, Char Newton. Population Total 413593; male 213918, female 199675; Muslim 403043, Hindu 10505, Buddhist 10, Christian 15 and others 20. Water bodies Main rivers: Tentulia, Batua; Sagar Mohana and Betua Canal are notable. 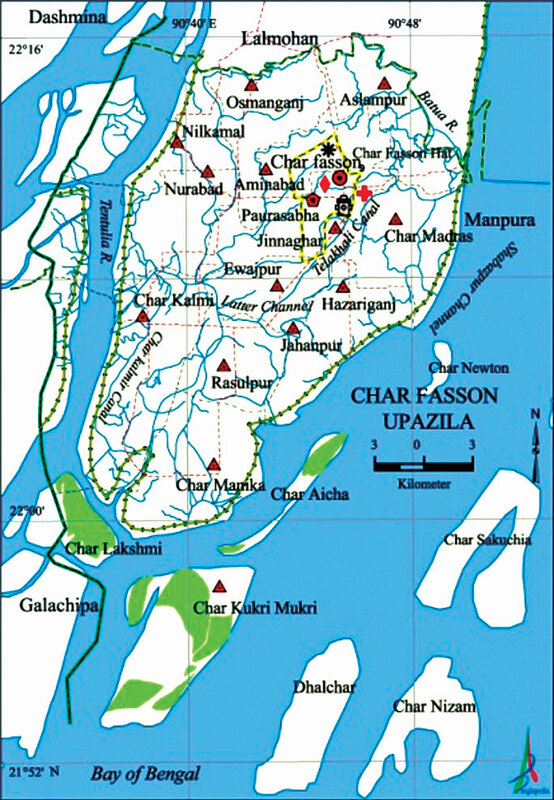 Administration Char Fasson Thana, now an upazila, was formed in 1970. History of the War of Liberation During the war of liberation in 1971, an encounter was held between the freedom fighters and the Pak army at a place in between Aminabad and Osmanganj in which 11 freedom fighters were killed or wounded. Newspapers and periodicals Weekly: Fasson Barta (Defunct), Upakul Barta, Pratham Akash. Cultural organisations Library , club 15, cinema hall 6, theatre group 4, stadium 1. Main sources of income Agriculture 68.09%, non-agricultural labourer 4.81%, industry 0.23%, commerce 10.44%, transport and communication 1.96%, service 4.45%, construction 1.08%, religious service 0.34%, rent and remittance 0.29% and others 8.31%. Ownership of agricultural land Landowner 50.69%, landless 49.31%; agricultural landowner: urban 53.98% and rural 50.35%. Main crops Paddy, wheat, chilli, pulse, ground-nut, betel nut. Extinct or nearly extinct crops Jute, sesame, linseed. Main fruits Mango, jackfruit, papaya, banana, betel nut, watermelon. Fisheries, dairies and poultries this upazila has a number of fisheries, dairies, poultries and hatcheries. Communication facilities Roads: pucca 96.80 km, semi-pucca 50 km, mud road 516.32 km. Extinct or nearly extinct traditional transport Palanquin, bullock cart. Cottage industries Weaving, goldsmith, potteries, blacksmith, wood work, cane work. Hats, bazars and fairs Hats, bazars and fairs are 58, most noted of which are Char Fasson Hat, Dular Hat, Goldar Hat, Letraganj Bazar, Chairman Hat, Shashi Bhusan Hat, Babur Hat and Baishakhi Mela. Main exports Paddy, chilli, pulse, ground-nut, betel nut, hilsa fish and shrimp. Access to electricity all the wards and unions of the upazila are under rural electrification net-work. However 3.79% (urban 21.44% and rural 1.95%) of the dwelling households have access to electricity. Sources of drinking water Tube-well 88.65%, tap 0.13%, pond 9.14% and others 2.08%.